DENVER--(BUSINESS WIRE)--Chipotle Mexican Grill (NYSE: CMG) has achieved its goal of moving to only non-GMO ingredients to make all of the food in its U.S. restaurants – including all of the food at its Asian restaurant concept, ShopHouse Southeast Asian Kitchen. The company is now actively developing new recipes for its tortillas, which are the only food items on its menu that include any artificial additives. Both initiatives underscore Chipotle’s commitment to serving food made from the very best ingredients. GMOs, or genetically modified organisms, are crops that have had specific changes introduced to their DNA that don’t occur naturally, using the science of genetic engineering. GMOs are common in the American food system. According to the USDA National Agricultural Statistics Service, 94% of corn and 93% of soybeans grown in this country came from GMO strains in 2014. As a result, more than 80% of foods consumed in the U.S. contain genetically modified ingredients, by some estimates, making it very difficult for consumers to avoid GMO ingredients in restaurants or in food purchased in grocery stores. Chipotle became the first national restaurant company to voluntarily disclose GMO ingredients in its food in March 2013, and pledged at that time to move to non-GMO ingredients for all of its food. Most of the company’s use of genetically modified ingredients was tied to soybean oil, which it used to cook chips and taco shells, and in a number of recipes (such as the adobo rub it uses for grilled chicken and steak) and for cooking (both on its grills and for use in sauté pans). Corn and flour tortillas also included some GMO ingredients. Chipotle suppliers planted non-GMO corn varieties to meet Chipotle’s needs for corn tortillas, and the company replaced soybean oil with sunflower oil to cook its chips and taco shells, and with rice bran oil for other recipes and uses. Both oils are extracted from crops for which there are no commercially available genetically modified varieties. Other GMO ingredients in tortillas were replaced with non-GMO alternatives. While GMO advocates point to higher costs associated with producing non-GMO foods, Chipotle’s move to non-GMO ingredients did not result in significantly higher ingredient costs for the company, and it did not raise prices resulting from its move to non-GMO ingredients. With the transition to non-GMO ingredients for its food completed, Chipotle has set its sights on eliminating the few remaining artificial ingredients from its tortillas. Excluding tortillas, the food on Chipotle’s entire menu consists of just 46 ingredients – nearly all of which are simple, whole ingredients that could be purchased at any local supermarket. By contrast, a typical Mexican fast food restaurant may use well over 200 different ingredients. Tortillas are the only food item on Chipotle’s menu that contains any additives, which include a minimal number of preservatives and dough conditioners. While the company has made significant strides in reducing the number of additives in its tortillas, it is now embarking on a quest to eliminate all of the remaining additives. The goal is to achieve a simple recipe with only a few ingredients, much like tortillas made in more traditional ways that include only wheat flour, oil, water, salt and a starter for flour tortillas, for example. Achieving this goal will be difficult and take time. Tortillas today are made very quickly and require the use of dough conditioners to give the tortilla the consistency that was once achieved by allowing the dough to rise slowly. Chipotle is working in close partnership with its tortilla suppliers and the Bread Lab at Washington State University to develop a new system of making tortillas that will allow the dough to rise slowly and eliminate the need for the dough conditioners. Eliminating the few preservatives will be slightly easier, but still a challenge simply because tortillas are difficult to keep fresh for long. The company has developed new tortilla recipes and initial taste tests have been very encouraging, but it’s too early to say how long it will take before these new tortillas will be served at any Chipotle locations. “We are changing the way people think about and eat fast food, and that means cooking with the very best ingredients – ingredients that are free of additives – but still serving food that is affordable, convenient, and most importantly delicious,” said Ells. “That’s really unusual in fast food, but that’s the quest we are on, and we continue to make progress." 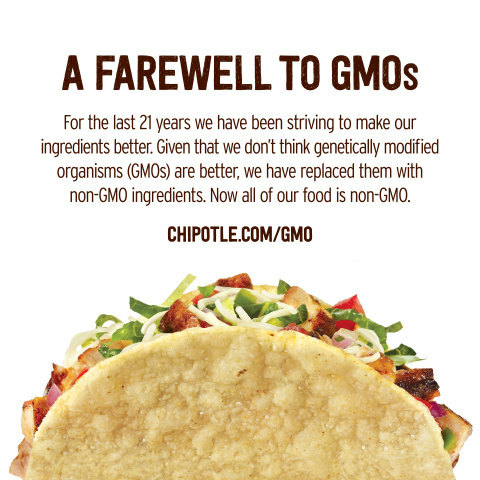 For more information about Chipotle’s ingredients and its move to non-GMO foods, visit www.chipotle.com/gmo. To learn more about its quest to make tortillas even better, visit www.chipotle.com/tortilla-journey. Steve Ells, founder, chairman and co-CEO, started Chipotle with the idea that food served fast did not have to be a typical fast food experience. Today, Chipotle continues to offer a focused menu of burritos, tacos, burrito bowls (a burrito without the tortilla) and salads made from fresh, high-quality raw ingredients, prepared using classic cooking methods and served in a distinctive atmosphere. Through our vision of Food With Integrity, Chipotle is seeking better food from using ingredients that are not only fresh, but that—where possible—are sustainably grown and naturally raised with respect for the animals, the land, and the farmers who produce the food. A similarly focused people culture, with an emphasis on identifying and empowering top performing employees, enables us to develop future leaders from within. Chipotle opened with a single restaurant in 1993 and currently operates more than 1,800 restaurants. For more information, visit Chipotle.com. Chipotle becomes the first national restaurant company to use only non-GMO ingredients and shifts focus to creating an even better tortilla.